You may have seen Eden Hazard of Chelsea stupidly kicking some ballboy at the Swansea match recently, but I bet you may not have heard of bo-taoshi. World of Sport has seen its fair share of bizarre sports, but the latest wacky offering from Japan takes it to the next level, crossing capture the flag with king of the hill and throwing in a whole lot of brute strength, concussion and ninjas. Bo-taoshi translates as pole bring-down and it’s pretty straight forward: two teams of 150 players compete for control of a wooden pole, 3-5 metres in length depending on the age of the competitors (who can be as young as eight years old…). Unsurprisingly, the Japanese make up for its simplicity with no holds barred refereeing, as the attackers work to pull down the defender’s pole by whatever means necessary. This includes punching, kicking and stomping their opponents. Pole supports – tasked with supporting the pole and ensuring it remains in an upright position. Pole supporters tend to be big lads who boast upper body strength and physical endurance. One of the challenges is communication as they must work as a team to keep the pole upright, so to make it as a pole support you’ll need a brain as well as brawn. Barrier – the players who form the wall of defence. Big and brutish, they believe in a ‘get back up and keep fighting’ attitude. Whatever the attackers give them, they’ll give it back…harder. The barrier works as a unit and is the first line of defence. Interference – they harass the attackers and interrupt any wave of attack which breaches the barrier. Players are typically small, nimble and pride themselves on their footwork. Generally irritating in their play, they’ll go for the knees. Scrum disabler – scrum is an offensive tactic where the attacker uses their teammate’s back to spring themselves over the barrier. A disabler must do everything in their power to eliminate the springer’s threat. The Terry Butcher’s of bo-taoshi, these guys aren’t afraid of pain. Ninja – the single man at the top of the pole sees everything. 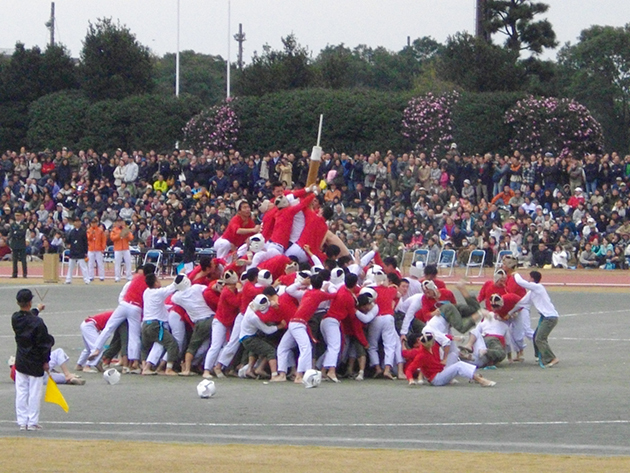 The ninja is the jewel in the crown of any bo-taoshi team and the last hope for victory amid a blur of bodies. The ninja must oppose a tilt of the pole by leaning to the opposite side and so counteracting the attackers’ weight. Springboard/scrum – the leaders of the pack. Two teammates work together to launch an aerial assault on the defenders – the scrum acts as a stepping stone so their teammate can springboard over the barrier. Communication is key, as is a strong back. Pole attackers – their job is simple: take out the ninja and bring down the pole. Relentless and obsessive, they won’t stop until the pole is lying at the thirty degree angle. General support attacks – they’ll do anything to make it hard for the defenders – they’re creative, clever and composed. The Japanese look for experience in this position. – look out for the white team’s ninja and the flurry of punches, head butts and head grapples from the red’s support attack! Headgear is encouraged at a senior level to prevent concussion, and footwear is banned to lessen the damage done by head stomping. The game was originally conceived by cadets at Japan’s National Defence Academy, although it’s taking modern day schools, colleges and universities by storm. However, parents are getting soft and many schools have since banned it from their annual sports day.